Sandy McNeely and Julie Hughes Callihan remove black cloth covering the markers. An enthusiastic group of onlookers gathered in the American Cemetery Saturday, Oct. 29 for the grave-marking ceremony honoring local Revolutionary War patriot, Antoine Prudhomme. The event was sponsored by the Natchitoches chapter, Sons of the American Revolution (SAR), and the St. Denis chapter, Daughters of the American Revolution (DAR). Charles “Sandy” McNeely, president of the local SAR chapter, served as the emcee and welcomed those present during his opening remarks. Rachel Ross, Regent of the St. Denis chapter, also extended a welcome to everyone who attended. The Presentation of the Colors was done by members of the Louisiana SAR Color Guard, who were dressed in Revolutionary-era uniforms. They were led by Ted Brode, Color Guard Commander, who is from the James Huey SAR chapter in West Monroe. Others in the Guard included Dr. Jim Morock, a member of the Enemund Meuillion chapter in Alexandria and who is past Vice- President General, SE Region, SAR. Rodney McKelroy of the Pierre Georges Rousseau chapter in Slidell and Tony Vets of Colfax also participated. Vets is currently Vice-President General of the SE region, SAR and is a member of the Natchitoches SAR chapter. Dr. Colleen Lancaster, Honorary Regent of the St. Denis chapter, gave the invocation and Tommy Joe Sibley of the Natchitoches SAR chapter led the Pledge of Allegiance. Wanda St. Andre, a member of the St. Denis chapter, recited The American’s Creed. Following the introduction of dignitaries, Don Mims read a Proclamation on behalf of Mayor Lee Posey. Mims is a member of the local SAR chapter and is the Mayor Pro-Tem of Natchitoches. McNeely gave a brief history of the patriot’s life, details of which are very sketchy and largely unknown. Wreaths were then placed near the grave site: from the Louisiana Society, SAR by Tony “Bo” Vets; Southern District, SAR by Tony Vets Sr.; Enemund Meuillion Chapter by Dr. Jim Morock; the Natchitoches chapter by Tommy Joe Sibley; and by Julie Hughes Callihan, who is a member of the St. Denis chapter and a direct descendant of Antoine Prudhomme. 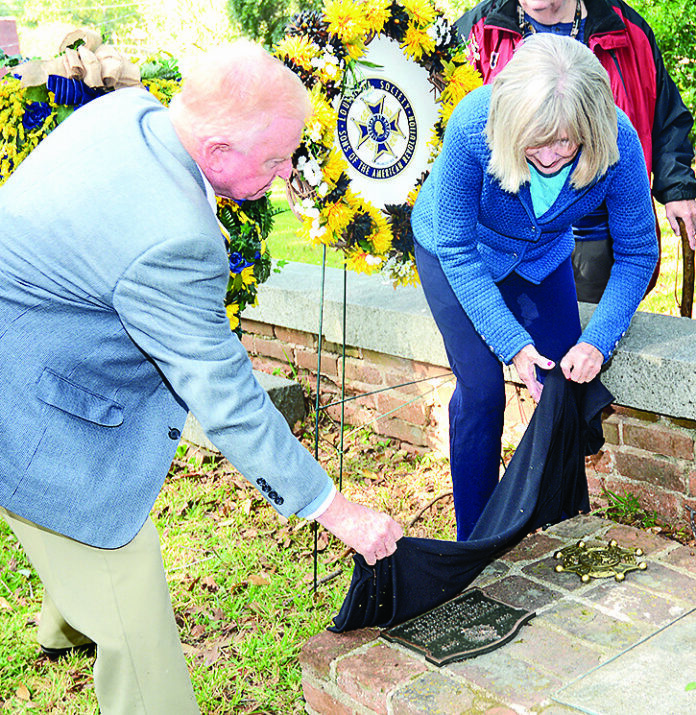 McNeely and Callihan then removed the black cloth covering the markers placed on the grave by the DAR and the SAR. The benediction closing the program was done by Tony L. “Bo” Vets II of Colfax, Trustee, Louisiana SAR. The Louisiana SAR Color Guard are, from left, Tony Vets, Colfax; Rodney McKelroy, Slidell; Jim Morock, Alexandria; and Ted Brode, West Monroe. Julie Hughes Callihan of Natchitoches was the only direct descendant of Antoine Prudhomme present. Sandy McNeely presented a certificate of appreciation to Don Mims. Ted Fowler, left, is the Commander of the VFW, Post 1962 of Natchitoches. His wife Dee Fowler is a veteran herself and Commander of the American Legion, Post 10 of Natchitoches. She is also a member of the American Legion Auxiliary, Unit 10. Also pictured are Harold Collier and his wife, Jo Ann. Collier is a veteran of 26 years who spent much time overseas. Tommy Joe Sibley presented the wreath from the Natchitoches Chapter of the SAR. Tony Vets of Colfax presented a wreath from the Southern District, SE region of the SAR. He is a member of the local Natchitoches SAR chapter. The two markers placed on the grave of Antoine Prudhomme by the DAR and SAR.